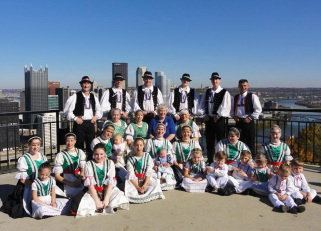 The Pittsburgh Area Slovak Folk Ensemble (PÁS), one of the premier ethnic performing groups in Pittsburgh for more than 39 years, recreates the splendor of Slovakia through traditional folk music, song and dance. Audiences have praised the authenticity of the entertainment which has helped them recall memories of their homelands or their ancestry. In colorful regional costumes of Slovakia, PÁS performs lively village dances from the Central Highlands of Det’va to the explosive Gorale footwork of the mountainous Tatras, to the leaps and jumps of the West and to the graceful and romantic movements of Eastern Slovakia. The spirit of this country comes alive through the music and singing of folk songs. Under the direction of choreographer Angela M Jumba-Lipchick, PÁS has performed for Slovak and civic organizations throughout the United States as well as for the Slovak Ambassador and Slovak Cultural Attaché to the US. The ensemble has also entertained with performances nationwide including the Cherry Blossom Festival in Washington DC, the 25th Annual Magical Music Days and Disney Performing Arts Programs at Walt Disney World in Orlando, Florida, the Slovak Heritage Festival at the PNC Bank Arts Center in Holmdel, New Jersey and has made several well-received appearances at one of the largest folk festivals in Slovakia, the Det’va Folk Festival. PÁS takes great pride in their mission of preserving and sharing their Slovak customs and heritage with their fellow Americans. All information, choreography, photos and videos © PÁS Folk Ensemble 2017.